This is an important public service announcement. Please read carefully. Thousands of babies leave hospitals each year and their parents and guardians are unaware that their infant is burdened with what the public calls super powers. These could include telepathy, tractor beam eye sight, and super-duper strength. Super powers can happen at any time. It's up to you to know the signs. If your infant is jumping out of her crib, sucking toys to her grasp with her gaze, or crushing blocks with one squeeze, contact your local super human authority immediately. If you want your infant to become totally rad, early detection is key. Your baby is special, she awes you every day. Sure, she's not bending the bars of her crib or launching from her playpen with her hands on her hips, that would be more than you could handle. As it is her cries regularly break the sound barrier in supersonic pitches and it seems like she reads your mind on the regular. Her face wrinkles as soon as you reach for the spinach and squash baby food, you can't pull the wool over Wonder baby's eyes! 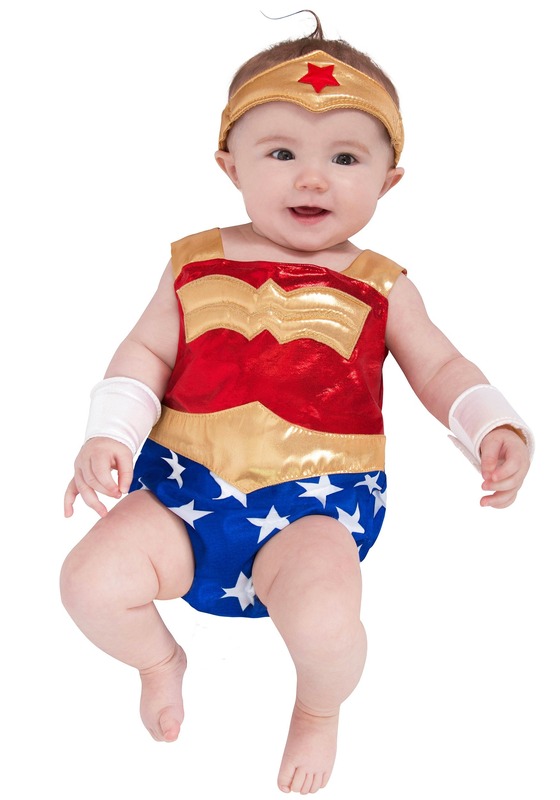 This Halloween, prepare her for the action-packed life she's sure to face in a few years. You know she's special, it's time everyone else got a heads up! This onesie has the gold and red bodice that everyone knows along with blue starred bottoms that'll fit comfortably over a diaper. Finish off the ensemble with an adorable Wonder Woman crown and the famous bracelets and she'll be ready to rock. Well, get rocked back to sleep that is.